About 3 hours nor’nor’west of Mt Isa is Boodjamulla, known in settler language as Lawn Hill. It is reportedly a magnificent national park, with escarpment country, spinifex and waterholes. It also has Kalkadoon and Carpentarian grasswrens, Pictorella mannikins, Buff-sided robins, Sandstone shrike thrushes, Purple-crowned fairy wrens and a notable plastic Indian peafowl. Since some of us Loudmouths are out of the closet as tickers, the shame of ticking a plastic is something we wear. A tick is a tick is a tick after all and a peafowl is one tick, just as a Night parrot is one tick. We did go to the address in Newport to tick a Barbary dove before they were all shot and we did go to Barham and tick an Ostrich while the population there was tickable (free living and self-sustaining population over 25 years is the single criterion). 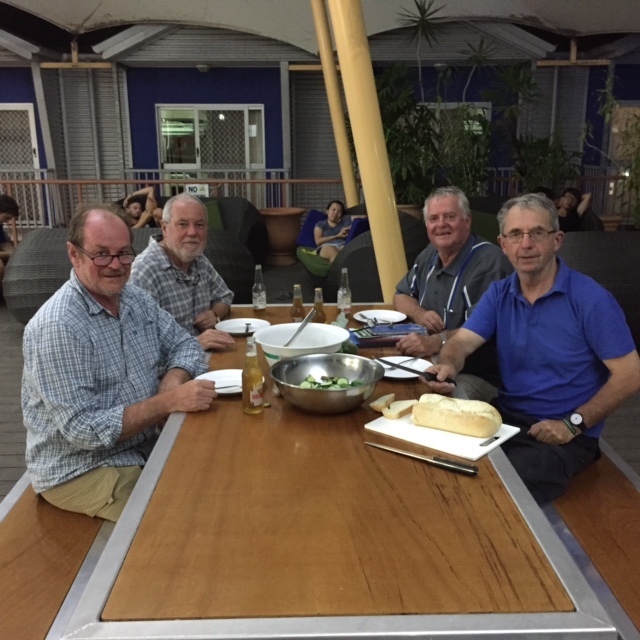 Come late June, 2018, I’ll fly across from Darwin where I’ll have just walked the Jatbula trail, the others (L to R – Russell Thomson, GH, Max Arney, Frank Mitchell, Paul Kelly behind the camera and Philip Jackson somewhere else) will fly up from Melbourne and we’ll meet at Mount Isa. Watch this space for pics and trip reports.